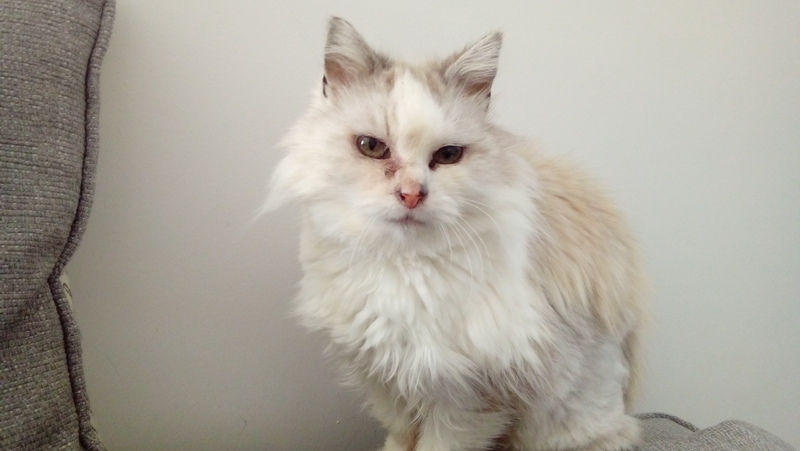 This year saw us rehome our first “Cat Guardians” cat, beautiful 17 year old, Flopsy. A family member contacted the Cornwall Adoption Centre and signed Flopsy up to the scheme over a year ago as her owner had sadly developed dementia. Within days of her owner going into care and the Cornwall Adoption Centre being contacted, a member of staff collected Flopsy and brought her in to be rehomed . Flopsy was in need of a full health check and as a result required a thyroidectomy operation, a dental and a dematt. She was also placed onto a special diet, for early renal disease. Being an older girl and deaf as a post the centre advertised for an indoor only home for her, possibly with a calm dog. After just a few weeks Flopsy was offered a loving new home. Flopsy’s new owner commented the scheme saying “It must provide current owners with enormous peace of mind that their beloved pets will be safe, cared for and carefully rehomed should they become unable to continue their care”, adding “Flopsy is a delightful cat and already loved by everyone who meets her. She can now put her feet up in her forever home and we feel privileged to provide it for her.” If you would like to know more about the Cat Guardian’s scheme please visit http://www.cats.org.uk/cat-guardians-service or pop into the centre for a leaflet.